I work for the police and my role has 3 main aspects. I attend crime scenes with a view to locating, preserving and recovering forensic evidence; I am responsible for developing & managing the forensic recovery strategy at major crime scenes; and I also have supervisory responsibilities for a team of 3 scenes of crime officers! Well it wasn’t my intended career at all when I started my law degree at University of the West of England! All my decisions from GCSEs onwards were tailored towards a legal career, however, during my second year I took a Forensic Science module and knew then that I didn’t want to be a solicitor at all….I wanted to be a scenes of crime officer! I was determined to complete my degree though, as I knew it would either be useful or at least look good on my CV. When I finished university, frankly, all I wanted to do was get on with earning money so I used my degree and took a job with a legal consultancy firm in Bristol who specialised in dispute resolution in construction contracts. A few pay rises and interesting clients/cases in that job meant I stayed for 4 years before realising that if I really wanted to pursue my ideal career – I’d better get on with it before I got too entrenched in my legal job and/or couldn’t afford the inevitable pay cut. It took a year to get from that decision to starting with Gloucestershire Constabulary as an Assistant Scenes of Crime Officer (SOCO) when I was 25. That was 12 years ago and the best career decision I ever made! I work shifts and have a mixture of weekday and weekend days off. I’m also blessed with a 4 year old daughter and a pretty much newborn baby (this is being completed during a feed!). My working days are intricately planned logistical nightmares that involve all the fine tuning of a military operation, executed by my husband and I!! If it’s a day shift, I’m up at 6:30am, eldest daughter gets up 15mins later. She goes to the childminder and/or playgroup when I am at work on weekdays. Packed lunches have been done the night before. Eldest is hustled into clothes and teeth brushed. We’re in the car at 7:20. At the childminders at 7:25. Off to work at 7:30. Get parked between 7:50 and 7:55 and scrape through the office door at 8:00. It’s very much to the wire when I do the drop-off!! I can never, ever know what the shift has in store for me – that’s one of the best bits about it but it usually involves reviewing incidents for SOCO attendance that have come in overnight; staff levels etc. I usually manage to get out every shift to carry out forensic examinations but the Crime Scene Manager role definitely involves more office time. 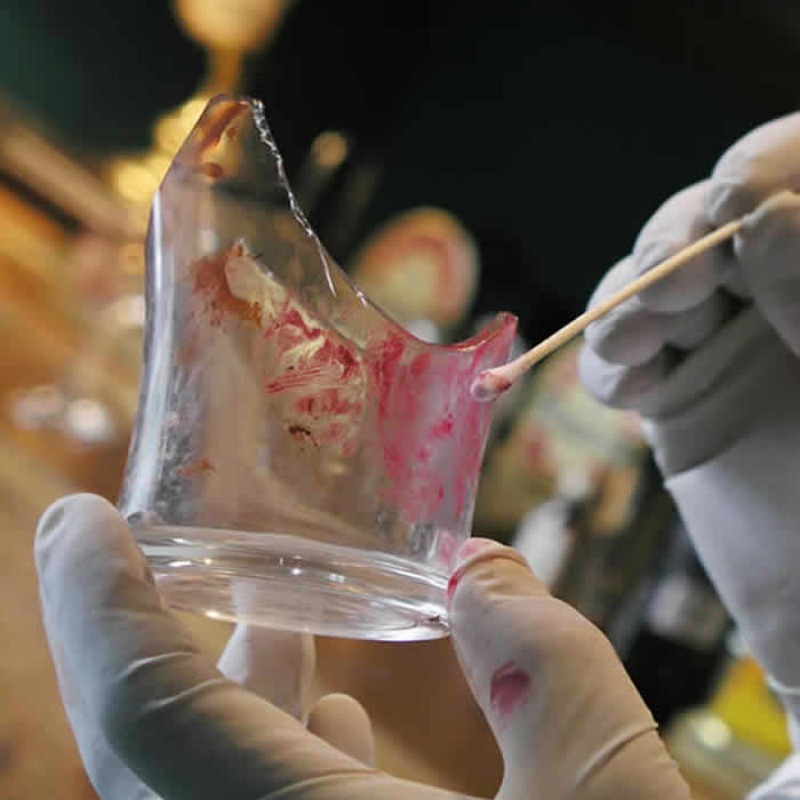 Crime scenes can literally be anywhere – outdoors in a car park or woodland or in people’s houses or commercial properties but we also work in mortuaries. We have a role in assisting the Coroner in the case of sudden deaths, even where they do not end up requiring a criminal investigation. Lunch is taken whenever I can fit it in, especially if I’m out and about all day – sometimes in the office; often in a supermarket car park! Late shifts start at 12:30 and finish at 21:00. In theory. Staying late is a bit of an occupational hazard so I rely on the flexibility of both my husband and childminders very much. I am also periodically on-call overnight for any major crime scenes that arise out of office hours. Call outs can be quite demanding physically and mentally but luckily don’t happen too often. Home time I have to be out the door bang on 4:30, especially if I’m collecting the eldest. I’m home a little after 5 and it’s straight on with dinner, which is between 5-6. There’s a bit of time to play and catch up with the eldest but her 7pm-ish bedtime comes round all too soon. Evenings tend to be spent on a really exciting mixture of chores and tv! Mornings on late shifts or weekday rest days are marginally easier because I have a bit more time to get the eldest out the door to playgroup….or soon, school. Home time is calmer because my husband has dealt with pick ups etc. When I get home, I take my boots off, have a cup of tea and potter about the kitchen or watch tv and catch up with my husband. I don’t usually go to bed until between 11-midnight on any day. I don’t think I really have free time…especially since our youngest has come along….it’s all busy, busy, busy in our house! Don’t even ask me what our mornings will look like when I go back to work after maternity leave! Helping people – that’s ultimately what my job is about. I love the sheer variety of my job and the element of detective work/problem solving – finding that one piece of evidence which could identify an offender. Well unless you could guarantee good weather conditions for outdoor scenes, I really don’t think I’d change a thing – I love my job!! I wanted to be a barrister at first – and then changed my mind to solicitor. I started my secondary education at a mixed comprehensive and could not work out boys at all! I went to a girls grammar school after the 13+ and fared so much better. I wasn’t really worried about my looks – it just wasn’t important to me then – but I was pretty insecure about where I fitted in within my class or my year group. I was definitely not one of the ‘cool’ girls! I guess it took me a while to get comfortable in my own skin. I think I was helped enormously by the fact that I was part of a group of 4 really close friends with whom I was completely comfortable. They were very much my safety net at that time! Don’t feel constrained to stick by decisions you’ve already made – there’s nothing that can’t be changed if you really want to. It really is true that you are good at what you enjoy. Don’t do anything just because it will make people like you (usually only temporarily anyway). If you don’t know what you’re doing – ask. There is zero shame in asking – you are merely gathering the information to make a good decision. And finally; make sure you get to know your allocated tutor at college or university. The jump from school to higher education is massive and I did not get my head around it for some time. The tutors are there to help and guide. Phew…someone find me a time machine!! Spare what now?! I like gardening, baking, being outdoors and I’ve recently taken up running, which I’m hoping to make more of. The Big Sleep – Raymond Chandler. Regular eyebrow waxing will help you feel well-kept eve without makeup. And let someone else treat your feet – never feels the same doing it yourself! Meal planning can save you loads of money. Set up a direct debit for more than your likely minimum credit card payment to help clear it quicker. Expect the unexpected – life can really throw curve balls at you when you least expect it! Really can’t choose between 1) new pants (total confidence boost!) and 2) command adhesive wall hanging strips – no drilling or holes in wall – can hang up to 7.5kg and can be removed without damaging paint work! Contact the Girl Did Good girls to reach me for more info! This entry was posted in A Day in the Life and tagged Adventure, career, changing career paths, Crime Scene Manager, Forensic Science, Girl Did Good - Life after lessons, Life After Lessons, Life after School, Life Experience, lifestyle, Mother, real life, Retraining, self improvement. Bookmark the permalink.